IQF (Individually Quick Frozen) Washed with caps removed. No water or sugar added. These strawberries are great for smoothies, jam, jellies pies and cakes. Nutritional Analysis: One serving (1 piece with 1/4 cup whipped topping) equals 197 calories, 5 g fat (3 g saturated fat), trace cholesterol, 125 mg sodium, 33 g carbohydrate, 2 g fiber, 2 g protein. Diabetic Exchanges: 1 starch, 1 fruit, 1 fat. Strawberries are extremely high in antioxidants, and Vitamin C. Given their unique combination of antioxidant and anti-inflammatory nutrients, it's not surprising to see strong research support for strawberry health benefits in three major areas: (1) cardiovascular support and prevention of cardiovascular diseases (2) improved regulation of blood sugar, with decreased risk of type 2 diabetes, and (3) prevention of certain cancer types including breast, cervical, colon, and esophageal cancer. Each 5 Lb. bag of Strawberries is packed in it's own Styrofoam container with a large gel ice pack and then placed into a cardboard box for shipping. When ordering keep in mind that if you want the strawberries to arrive frozen you need to choose an overnight or 1 day shipping option. 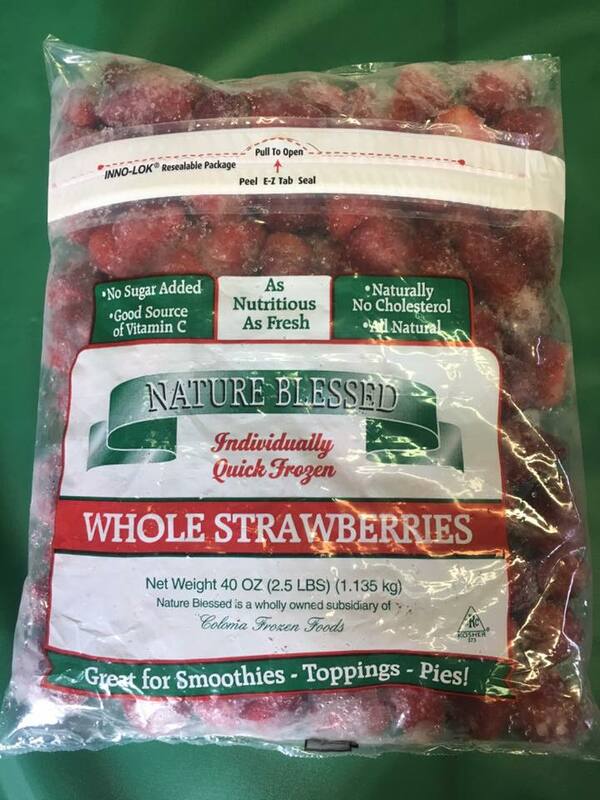 If you choose another shipping option the strawberries will thaw some, but can be re-froze when you receive them. We ship every Monday and Wednesday of each week all year long. Keep in mind when ordering that there is always less thawing in the fall & winter months than in the summer months.